This cold chicken shabu sahbu salad is perfect for the day like today. My husband really liked this dish! I found this recipe on a popular Japanese cooking site. I used only ingredients I have, but it still came out great. 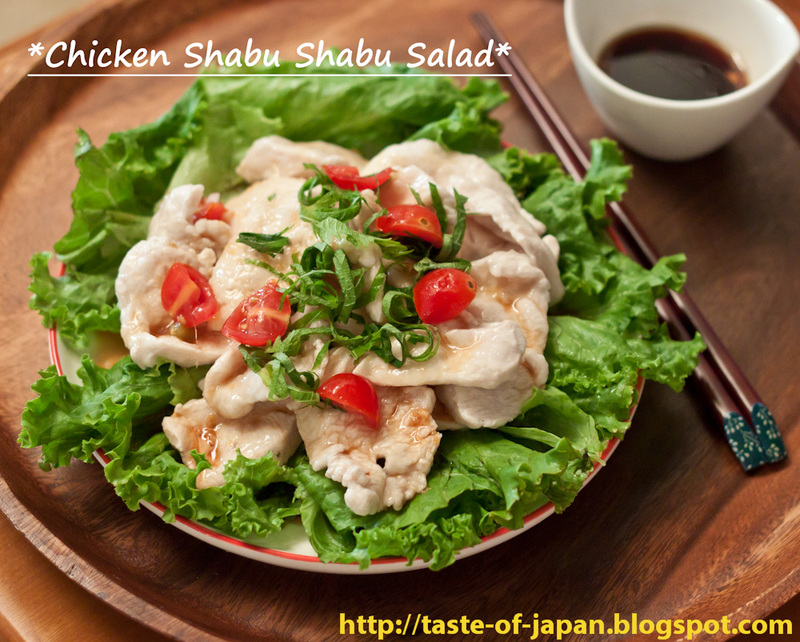 Shabu shabu usually calls for pork, but this salad is made with chicken. Dusted with potato starch, chicken has unique and smooth texture. This dressing is amazingly good too! 1. Cut chicken in half lengthwise. Thinly slice them. 2. Lay the chicken between two sheets of plastic wrap and pound out to get thinner slices of chicken. 3. Dust with potato starch. Put the chicken in boiling water and cook through. 4. Dip them into a bowl of ice cold water. 5. Mix all the ingredients for dressing. 6. Serve on a bed of lettuce. Garnish with oba shiso leaves.